Ukraine’s leading political party has said that the international financier George Soros has been preparing a “Lybian scenario” for the country. ­The head of the Party of Regions parliamentary faction Aleksandr Yefremov said in a televised comment on Wednesday that he had information that George Soros had allocated funds for the overthrow of the Ukrainian political authorities. The information about George Soros’s involvement in Ukrainian politics was openly voiced by Yulia Timoshenko in 2008. Timoshenko, then the country’s prime minister, said that she was attempting to minimize the effect of the global financial crisis by following George Soros’s advice. 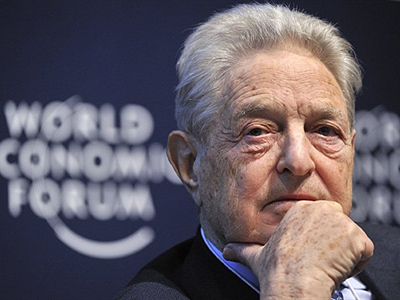 This raised suspicions that through such advice George Soros could influence the rate of the Ukrainian national currency in his own speculative interests. Several officials from president Yushchenko’s administration said they wanted to launch a probe into Soros’ Ukrainian activities, but it did not happen. It was only in 2010 that the Ukrainian State Security Service started to check the activities of the Vozrozdeniye foundation, officially sponsored by Soros, and its ties with other Ukrainian NGOs, but this probe gave no feasible results. The Soros Foundation reacted to Yefremov’s statement almost immediately and refuted all accusations. The foundation said in a special statement that all funds allocated for Ukrainian programs are being spent on the development of the open and democratic society and also for helping Ukrainian citizens, who suffered from the effects of the international financial crisis. The statement also said that the accusations of funding some antigovernment activities should be backed by proof and that the policy of the foundation was maximum transparency that left no room for such criticism.